Photo cribbed from Spyparika's Photbucket site. The analog signal is gone. Hurrah! One manifestation of a technology gone awry has vanished. May the rest of television and its cable monopolists share the fate of record companies as content goes online. Bottom line: I prefer virtual worlds and gaming to TV because I chose the time and place of engagement and, more importantly, it's interactive. When there's a show I really want to see, like The Sopranos, I get a DVD of the series. My local alternative weekly has yet to run this essay of mine about why I hate television. Here it is. I just resent it to the editor, too! That’s the funniest of all the reactions, over the last 30 years, to my admission that I do not watch television. 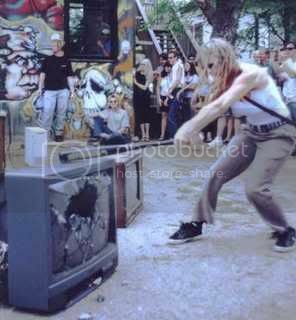 Now that analog television signals are history, I could care less. Anything I want to watch, or better yet, experience, can be found online. Despite the tiny stickers I leave about, showing a grinning picto-person smashing a TV set with a sledge hammer, I’m not really the “kill your television” sort. When I went to college in 1979, I just fell out of the habit. That was a time before every student’s dorm room or apartment had cable, let alone high-speed Internet. I never got back into regular viewing again, except for a weekly ritual of dinner with my parents followed by Wheel of Fortune and Jeopardy. In fact, why should I have gone back to television? The 1974-5 season, to my bizarre tastes, had the perfect Friday line-up of shows: Planet of the Apes, Rockford Files, and Kolchak the Night Stalker. Then I got a driver’s license, which meant drinking bad beer, chasing girls, and drag-racing. To my credit, despite my obvious lack of a brain, I had more luck driving than did Jim “totals a Firebird every week” Rockford. Considering my 90+ mph rampages down a then-lonely West Broad Street, I can conclude that television is not the most dangerous activity for teens, then or now. Yet when the habit left me, it became clear that I’d never again live my life by a schedule that a network and cable set for me. That urgency—stop your life! Don’t miss the all-new episode!—lies behind my disdain for the medium. Today, however, the coming of television-on-demand, internet archives of old shows, and the end of the analog signal force me to consider: under what conditions would I start watching regularly again? Though much programming—from Charlie’s Angels to The Simple Life—has been execrable, it was never the quality of content that kept me from surrendering free time to the screen. Good programming abounds, even in series deplored by morally indignant people who would never laugh at a poop joke. Case in point: Stone and Parker’s Southpark satire of World of Warcraft gamers is not to be missed. My wife and I, both devotees of all films Mob-related, are working our way dutifully through the DVDs of The Sopranos. We can watch Tony put “two in the hat” of some goombah at any time and pace we wish, and I plan to repeat that ritual for the critically acclaimed, dark-and-downbeat remake of Battlestar Galactica. Old series return to life in other ways too, as 1970s-era monsters chase Karl Kolchak across my screen whenever I slip a DVD into the player. The same one-episode history goes for Cheers, Survivor, and King of the Hill. They were all fun, except for Survivor—watching that parade of greed and betrayal, I felt my brains trickling out of my ears and was reminded why most of TV makes me gag. I hoped a bunch of cannibals would show up to kill everyone, especially the studio bosses who green-lighted the reality TV movement. All in all, my limited experience with contemporary television has taught me one important lesson: I don’t think my life is less complete for not having watched all of these shows. For the very best series, I’ll get around to it. At the same time, it excites me that TV may be getting more interactive, even as it loses eyeballs to games and on-demand content online. In 2007, CSI New York permitted viewers to create avatars for the virtual world Second Life. In a subplot for the show, a killer left bodies around New York dressed as avatars while concealing clues in the virtual world. CSI viewers actually became part of the show by looking for leads in Second Life, and the results of their investigations were supposed to feature in later episodes. This is not quite the same as deciding how an episode ends, but it may be a step toward fully interactive multimedia programming that will enter our homes through the same cables now carrying only passive entertainment. In such a world, one could pick exactly the show one wanted to “be in” and the role in which one might “act” alongside actor-avatars. Friday night we might all become Jim Rockford, Jim Kirk (his Chris Pine version from the new film, for you youngbloods), Dr. Quinn, even Homer Simpson or Jethro Bodine. Even I might tune in, then, and stop having to tell people that no, I’m not in a cult dedicated to pulling the plug on TV. I would be part of a cult making TV a lot smarter.